As Jon alluded to in the previous post, The Well is now operating a fledgling hydroponics system for the shared benefit of our broader community. This week, a small group of us has the privilege of participating in aquaponics training at Morningstar Fishermen in Dade City, Florida. We are joined by students from around the globe to learn more about using this unique combination of aquaculture, hydroponics and agriculture to create healthy and reliable food sources. In addition to a shared interest in plants and fish, many of those in attendance also have a common burden for communities that struggle with hunger. A fellow student from the U.S. shared over dinner yesterday evening that he too was frustrated with local efforts in his state to criminalize not only being poor, but the efforts of others to feed the poor. He then remarked with a grin that teaching people to raise their own food was his way of "giving the finger to the system." His is a frustration that I know all too well, but I also share his optimism for the growing influence of small food producers on larger systems. I wanted to take this opportunity to share why. Over a span of nearly two centuries, armies of "farmers and peasants" in nearly every country on the American continents have fought successfully for independence from colonial powers. This most recent century witnessed the transformation of all workers into what Peter Drucker referred to as knowledge workers, and the erasure of a separate class of laborers. During the last decade, the so-called maker movement has emerged to so enthrall millions of industrious Americans, that they have abandoned traditional education and employment in droves. Even among those struggling with poverty in our own community, we at The Well hear voiced constantly a desire to labor, serve and innovate. Today's revolutionary farmers are more educated in biology, technology and the mechanisms of global economics than any generation that has preceded them. Makers and tinkerers of every kind also have unparalleled access to empowering information from Wikipedia to MOOCs. 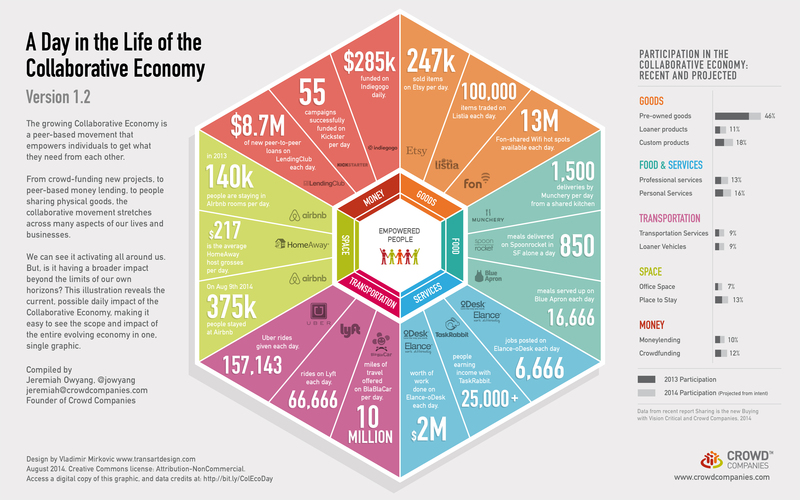 Perhaps most encouraging to me is the thriving collaborative economy that has emerged in the last few years that indicates a cultural shift toward de-stigmatizing cooperation, shared-use and interdependence. Specifically as it pertains to nourishment, demand has exploded in the last few decades for foods that are grown locally and sustain both healthy bodies and a robust ecosystem. A growing number of visionaries are now working to take the energy and creativity of the masses and combine it with a knowledge of local food production that is sustainable, scalable and enormously subversive. As a result, the balance of power over what we eat is slowly shifting from monopolies and global conglomerates to the local producers who treasure our planet and value an intimate relationship with those for whom they produce food. Viewed together, these trends converge into a single "mega-trend" that could be described as the democratization of the means of production. Put simply, everyday workers increasingly have all of the knowledge necessary to produce every material thing that we need to live full and abundant lives. It is only natural that, as a fundamental need and the basis for a healthy mind and body, food should lead the way in this revolution. People who are not hungry have the time and energy to be creative and pursue other interests - interests that may include creating and building things, or more ominously for some, the energy and determination to undermine and tear down systems of tyranny and oppression. The hope for our own efforts to cultivate fish and plants is to both feed and educate those in Tampa's urban neighborhoods who struggle with food insecurity. The familiar image of a revolution may be an angry mob with torches and pitchforks - but the sense of generosity, gratitude and peace cultivated by growing and sharing food serves as a reminder that ours need not be a violent revolution. After all, the greatest revolution was started using a few loaves and fishes along with the admonishment to be kind to each other and serve those in need. We live in an incredibly exciting time, and despite the resistance posed by self-serving institutions and the powerful few, we have every reason to be encouraged. To you who are already laboring with this mission: Let your torches shine boldly from the hilltop and keep your pitchforks working toward the more abundant future we know is possible. To any who still dare resist this revolution: No matter. The farmers and peasants are coming.